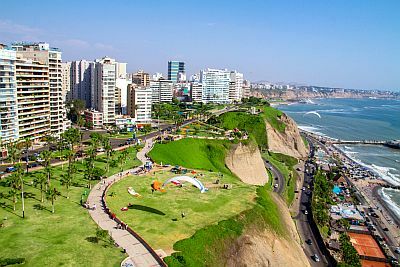 In Lima, the capital of Peru, the climate is very peculiar: it is subtropical desert, with a warm season from December to April, and a cool, humid and cloudy season from June to October, with May and November as transition months. The city is located in the central part of the Peruvian coast, and despite its location, about 12 degrees south of the equator, the climate is arid and very mild because of the cold Humboldt current. During winter, from June to September, the sky is almost always cloudy, and there is a kind of mist, the garúa, which can deposit a bit of moisture on the ground; temperatures are mild, but the lack of sunshine and high air humidity increase the feeling of cold, also because houses are not heated. Thermal inversion favors the accumulation of pollutants on the ground, despite the proximity to the sea. During summer, from December to April, sunshine is frequent, at least in the warmest hours, while in the early hours of the day, fog may still form. Even in this season, at times banks of low clouds can form, though more rarely. The temperature is pleasantly warm. The climate of Lima is affected by the cycles of El Niño, the phenomenon consisting in the abnormal warming of the Pacific waters. In El Niño years, both air and sea temperature increase, especially in the early months of the year when there may be long periods with practically tropical heat. For example, in February 1983, the monthly average has been 27.1 °C (80.8 °F), while in January 1998 the highest recorded temperature has been 33 °C (91.5 °F). Normally, however, the temperature does not reach 30 °C (86 °F) even in midsummer. The rains are very scarce or quite absent: apart from the mist that falls to the ground in winter and the very rare and sparse shower that occur in summer, it practically never rains. Unlike what happens more to the north, and to the east where the Andes are located, in Lima it usually does not rain even in the years of El Niño: for example, it did not rain in 1983 and 1998. However, owing to the increase in rainfall in the Andean region, during these periods the rivers that cross the city (Chillón, Rímac, Surco and Lurín) can swell, causing landslides, and there may be a shortage of potable water. The rains in Lima are so rare that they occur a few times in a century. Over the past 100 years, it is worth mentioning the event of March 7, 1925, when 10 millimeters (0.4 inches) of rain fell, that of January 7, 1952, and that of January 15, 1970, when there has been a heavy shower, which unloaded 17 mm (0.7 in) of rain in 5 hours and caused flooding (mainly due to the absence of an adequate drainage system). The amount of sunshine in Lima is decent, though not excellent, in the warm period, from December to April, while it is extremely poor from June to November because, as we mentioned, the Humboldt current causes fogs and low clouds: there are about 6 hours of sunshine per day from January to April, and only one hour from July to September. Usually, in Lima the sea is never really warm, though it becomes acceptable for swimming from January to March. However, in the years of El Niño the sea warms up by a few degrees.